It’s amazing what a little salt can do to enhance your swimming experience! 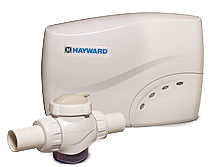 We are proud to offer HAYWARD salt systems to fit every budget. Salt & Swim 3C delivers the 3 Cs of salt chlorination – Comfort, Convenience all at a Cost you’ll love. 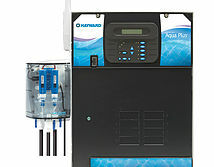 AquaRite 900 series, with extended life turbocell, is the most convenient alternative to conventional chlorine. Bringing your pool the very best in soft, silky, perfectly sanitized water without you every having to left a finger. Plus, with a 4-year warranty, you can relax in the comfort of your pool completely worry free. AquaRite 925 for up to 25,000 gallon pools. 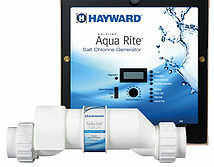 AquaRite 940 for up to 40,000 gallon pools. Automating essential pool and spa functions can save you as much as 70% on your energy bill and a lot of time spent maintaining your pool. In addition to automating your pump and filter, you can automate cleaning, chemistry automation, and backyard features like spa jets, lighting, water and fire features and more. AquaPlus provides the right-sized salt chlorination. Salt Chlorination TurboCells are available in three sizes – 40,000, 25,000 and 15,000 gallons. The three sizes enable you to right-size your system for the most efficient and cost-effective chlorination possible.